If history has taught us anything, it’s that those bad guys will always be around. If we don’t want them stealing ancient artifacts that doom the entire planet, or masterminding evil schemes to dominate the Earth, then we need some heroes. Perhaps you’re willing to take on that job? Just think about it for a second. When Ares tries to start a war, you can swoop into action and sock him square in the solar plexus! If Doomsday thinks he can just show up and start trashing Metropolis, you can slug him back into last century. You could even start your own superhero team! You just need a determined attitude and the outfit of a true hero. Well, now’s your chance, because this deluxe Wonder Woman costume is designed to recreate the look worn by Gal Gadot in the DC Universe movies. It comes with a bright dress with attached blue shorts and skirt. The attached belt looks like something straight from Themyscira and the wrist cuffs look fit enough to block a few speeding bullets (they’re made of foam, so don’t try that at home). 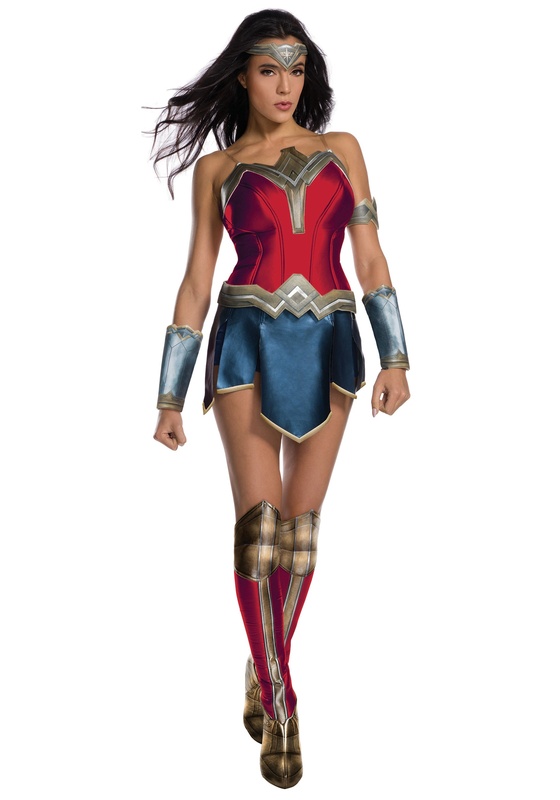 The final pieces to the outfit are the tiara and the red boot covers. The only thing it’s missing is a myriad of super powers to help you defeat evil! Make sure to grab a sword and shield from our Wonder Woman accessories to make sure you’re ready to stand beside Batman and Superman in the war against super villains.